France; Late 14th Century. Latin Text; Gothic Script. The Psalter with its one hundred and fifty psalms is the best collection of religious lyrics which the world possesses. It is no wonder, therefore, that it forms an important part of so many medieval manuscripts. The Psalms are found not only in manuscripts of the Bible, but also in Missals, Breviaries, and Books of Hours; and, as they had to be memorized by the priests, they were also transcribed separately. In the earlier periods there was generally a harmonious unity between the spirit of the ornament and the character of the writing. This unity is exemplified in this leaf. The three-lobed, gracefully drawn, symmetrical fronds of leaves in the ornament are usually accepted without question as representing the ivy plant. In the Middle Ages many magical and medicinal qualities were attributed to this plant. Unfortunately, fire and water, mice and men have in the course of the centuries often left their damaging marks on manuscript leaves. Some pages of this manuscript book show the effect of having been exposed to dampness. Some of the leaves from this manuscript contain text in French--this is one of only a few manuscripts in the Ege portfolio not entirely in Latin. Ege is incorrect in identifying this leaf as coming from a Psalter: it is clearly from a Book of Hours. The vellum is thick and dirty, and has been cut or torn across the top edge. The lining is done in ink, with the primary text in brown and blue, orange, and white in the decoration. There are large illuminated initials with painted blocks. In the left margin on both sides is a large gold and blue bar with pointed ivy, and the decoration bleeds through to the opposite side of the leaf. 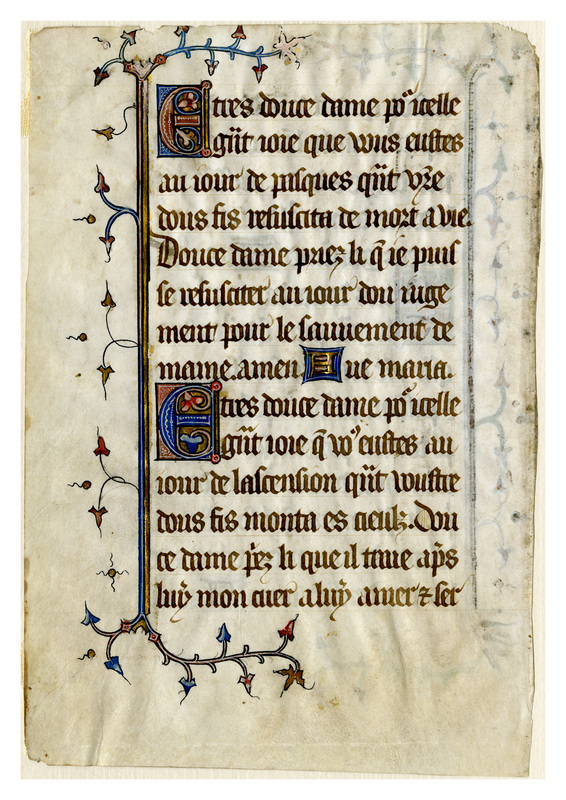 Text: The later (usually numbered as 11-14) of the 15 Joys of the Virgin, in Old French. Reconstruction Note: In Ege's original manuscript, this leaf was separated by one leaf (not yet located) from what is now Leaf 25 in the Cleveland Public Library portfolio; the latter directly followed Leaf 25 in the Cincinnati Public Library portfolio. The three (four) leaves contain nearly all of the 15 Joys of the Virgin. eustes quant vostre dous filz reput. v. mile hommes de. v. pains dorge & de. ii. poissons. Pechez li douce dame q'l veille mes v. cenz gouimer. Ave Maria. E tres douce dame pour icelle grant pitie que vous eustes quant vostre dous fis souffrit mort & passion pour touz pecheurs et pour toutes pechercesses [ ] de la mort denfer. Douce dame priez li que la mort q'il souffrit me delivre de touz mes pechiez & de la mort denfer. Amen. Ave Maria. E tres douce dame pour icelle grant joie que vous eustes au jour de pasques quant vostre dous fis resuscitata de mort a vie. Douce dame priez li qu'ie puisse resusciter au jour dou rugement pour le sauuement de mame. Amen. Ave Maria. 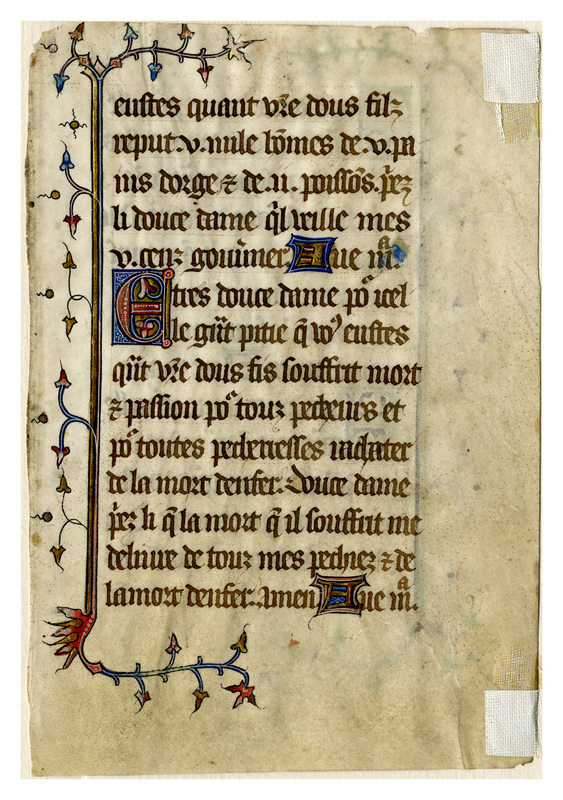 “E0025 Leaf from a Book of Hours,” Digital Exhibits | Denison University Archives & Special Collections, accessed April 23, 2019, http://exhibits.denisonarchives.org/items/show/47.